I have almost forgotten about this American Apparel skirt. The last time I wore it was almost 2 years ago in Canada. The funny thing is that I didn't even think about it until my husband mentioned. He was like, "Hey babe, let me guess, you haven't worn this skirt since Canada, right?" Ever since I turned one of the rooms into my messy closet, whenever he goes to my "closet," he shakes his head because he thinks I have way too many clothes and shoes that I forget about some of them. His jokes that he will start selling some clothes and shoes since I can barely remember I have them. Seriously, I might not even recognize until the day I suddenly want to wear it. LOL! Very pretty!Love the color combo! I'm going to A.A right now to find this skirt, I love it!! This colour is amazing! the combination with denim shirt is perfect!! omg! I'm speechless for your shoes!! I love the whole combination. The maxi skirt wit the denim shirt is just perfection; and the shoes completes the outfit. The bag is gorgeous too. Love ur blog! Beautiful! I love the color scheme here. I can never get enough of pleated skirts! That green color is so dazzling. I like that you made it casual with the chambray shirt. Fantastic outfit,sweetie, i like everything from the snake print shoes to that gorgeous midi skirt! I have the same problem and my fiance has the same "solution" LOL. I love this skirt! 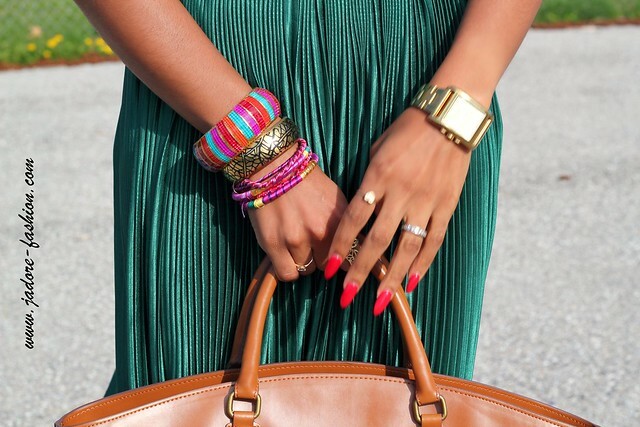 The pleats and the color are stunning. Glad it was reborn! very nice. I really am feeling those shoes - and love your bag. Dying for a pleated skirt in a blush color! Love the way it flows and that it goes with anything! Particularly liking the denim top with this! I love the pleated skirt. It's a great color, and pleats are so hot right now. How could you forget that amazing skirt? It looks awesome with the shoes and love the bag too! The skirt and the shoes! WOW! That is such a gorgeous outfit, I want want want! I need to try the denim with maxi skirt look! Just need to find the right skirt! oMG, OMG, OMG!!! I love that skirt! You look FABULOUS!!!!! Very pretty skirt and shoes!! Stella looking fabulous and so chic as always. Gorgeous skirt. loving the denim pleats combo! super! you look amazing! love green color! Those shoes look great on you and the emerald color in general. Your heart ring is adorable as well. I saw this blog last night and no doubt this is the awesome fashion Blog. Beautifuuuul!! Those green snakeskin shoes are hawt! I saw this blog for the first time and no doubt this is the awesome fashion Blog. Nice post. The monochrome color combination is unique.